In the previous pages we talked about how opal makes their colours and the reason why each stone has unique patterns. In this chapter we are going to show you some examples of colour patterns. 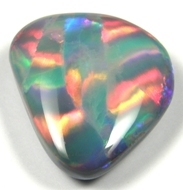 The opal which has this type of pattern has a very dramatic face. Once you hold this type of stone in your hand and tilt it in a particular direction and you can find a very brilliant colour that appears. It's very hard to show you with a still photo like this, but this stone has a very brilliant red, yellow and green in one direction. 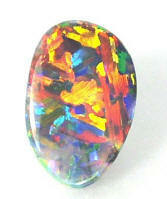 This type of opal will suit to make rings because the colour will change dramatically with your hand's movement. 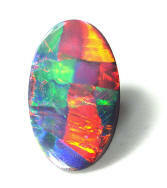 The opal which showing parallel bands of colour, and lying side by side in a manner, is called Ribbon Pattern. If those colours are totally different to each other, or contrast the whole stone, it will increase more value and more brilliancy. This type of stone has many tiny coloured dot as their pattern. 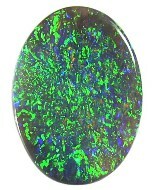 It is most well known pattern in opals. Like the palette for an artist, many colours are placed in the whole face of the stone. The stone has this type of pattern which is very beautiful and brilliant. Like appearance of the Chinese language chracters. It resembles piece of flattened straw crisscrossing each other. 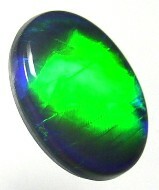 A Harlequin stone is the most prized of all opals. They are extremely rare and were often referred to by the old miners as tartan shirts opal. We've saw only seven patterns here. All stones are not perfectly categorize into some pattern. If you see 100 stones, you might find 100 different patterns from them. 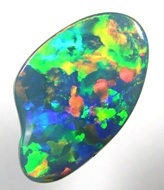 The image you get from the stone can be the pattern for the particular opal.